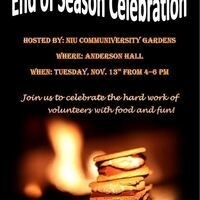 Come visit and gain knowledge about the NIU Communiversity Gardens while celebrating the end of the Fall season! We will have a bonfire with chairs and treats in the grass area by the garden to enjoy with peers. The hour before the event (4-5 pm) will still be volunteer hours, so anyone can come and work in the garden, like always! We're excited to celebrate with everyone soon, and to celebrate the a productive Fall semester!